Once you learn how to use your sharpening stones the right way, there are some really important things to keep in mind to always keep you stones in good condition and avoid useless damages. This article will hopefully help you maintain your water stones in perfect condition, even after a long time after buying them. The beauty of water stones in my opinion, is that they don’t really require anything to function. Unlike other sharpening devices, stones are just… stones. Simple maintenance and proper use will make your stones last a lifetime. This is one of the most important things to do. As you know, the water stones lose material while sharpening. The abrasive components of the stones, together with water, help you remove metal from your blade. The green stone is not flat anymore. This is normal. How could you possibly grind metal away from the knife without damaging the stone? Overall, you’re wasting stone surface space and also risking to damage your knives. In fact, you can’t really keep a fixed sharpening angle on a deformed stone. How do you flatten your stones? 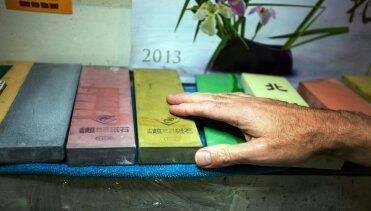 You can use a flattening stone, also called fixer stone or nagura stone. A flattening stone is usually a very hard stone, 180# grit for example. You simply rub the dished stone with the flattening stone to restore flatness. It’s very simple and can be done in less than 5 minutes, possibly every 1 or 2 sharpening sessions. It’s important to wash your stones with water after each use, to remove the excess material and debris. After washing them, dry the stones well with a cloth. It’s important to let the stones air-dry overnight before storing them. If you store them straight away, even if they seem dry, the stones will still contain water. If stored in a closed box, mold can form, and the stones can look and smell very bad the next time you use them. I once forgot to dry the stones, and temporarily put them away in the box… well… one week later I wanted to use them again and they had black/white spots on them. I easily washed them but I won’t let this happen again! This is related to the sharpening technique but also to the maintenance of the stones. Every stone has a different grit level for a reason. You should choose the grits well to match them with the condition and hardness of a knife. You don’t want to sharpen a very dull chef knife on a #3000 grit. This will easily damage the stone, and it will also be very difficult, if not impossible, to raise a burr. 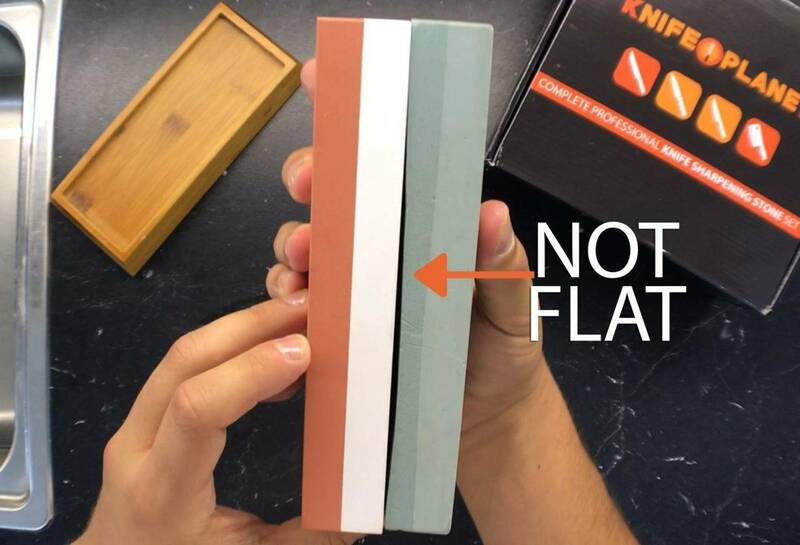 You can sharpen a very dull knife on a 200/400/1000 grit. Then proceed to 3000+ grits. In this way, you will apply heavy pressure on harder stones, and lower pressure on softer stones. Sometimes, if the edge is still “good”, you can start directly on a 3000 grit to simply “hone” the edge back in place. Sometimes you don’t really need to remove excessive metal to restore sharpness. Simple stone care will take a little extra effort and time, but your recent water stone purchase will last for many years to come if maintained properly.